Holden's timing hasn't been all that great at recent shows (we journos remember the silence as the Hummer was revealed), but it has picked a good time to Cruze. What is it: Holden's much-hyped new small car. Highlights: The headline car at this year's Holden stand was once a Suzuki mini-SUV hatch. 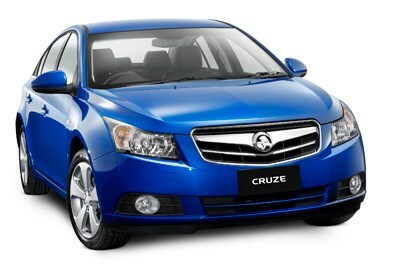 Well, sort of... about seven years ago, the AWD Holden Cruze shared the platform of a front-wheel-drive Suzuki Ignis. While Holden has re-used the nameplate, the car is completely different. The new Cruze small car will go on sale in the second quarter with two petrol engines: a base 1.8-litre four, and a 2.0-litre turbodiesel (CRDI). Transmission choices are a standard five-speed manual or optional six-speed sports shift auto, and two spec levels of a base CD and CDX will be offered. See the release below for details. Best of all, Cruze gets standard ABS, EBD, TC and stability control and six airbags as standard, so it's looking at a reasonably high safety rating. Stay tuned for reports from the show floor. Full specifications, fuel economy figures and pricing will be released closer to launch. Could we finally see a petrol-electric Commodore almost two decades after Holden teased the ECOmmodore hybrid concept?